"The most probable origin of mayonnaise is that the recipe was brought back to France from the town of Mahon in Menorca (Spain), after Louis-François-Armand du Plessis de Richelieu's victory over the British at the city's port in 1756. According to this version, the sauce was originally known as salsa mahonesa in Spanish and maonesa in Catalan (as it is still known on Menorca), later becoming mayonnaise as it was popularized by the French." Put first the egg in the beaker, then add the oil and the rest of ingredients. 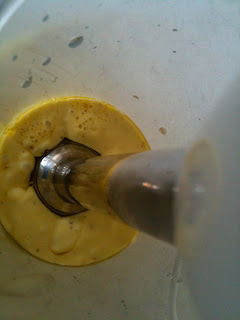 Put the stick/hand blender at the bottom of the beaker, blend at low speed and lift the blender slowly. You'll get something like the picture. Done! This "mahonesa" is not very thick, if you wanted it thicker you'd need to add a bigger amount of oil. And remember, you shouldn't keep this Mayo in the fridge for more than 3 days, it is not like the one from the supermarket ok? that's why I've used just one small egg. 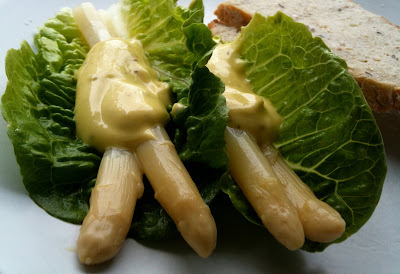 White asparagus, lettuce, and homemade sour dough bread. thanks Maria. it looks good and easy to make. will definite try that. we like Mayonnaise! Good luck Austin and let me know the results.